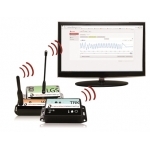 Newsteo® Battery operated wireless monitoring systems for local, networked or remote solutions. A wide variety of devices are available to accept most sensor types. The radio interface is capable of transmitting the readings over a reasonable distance or through several walls. Offering simple configuration and reporting, Newsteo® data loggers can operate in permanent monitoring mode with data being sent to a host computer or to a network or hosted location using a powered gateway unit. Alternatively Newsteo® data loggers can operate in data logging mode, recording data until a request is made from a host computer. To communicate with the loggers, you would just need to bring the host computer device within radio range of the unit. Also included within the Newsteo® data logger range are some highly capable logging units which can record Temperature, Humidity, Light Levels and shock events; Ideal for monitoring sensitive or fragile items during transportation. Complete Newsteo® Starter Kits for most of the Wireless Data Logger types, comprising the device, software, USB-RF interface. Software options available for the Wireless Monitoring Systems. Radio Relays and Data Collectors for use with the Wireless Data Loggers. Wireless Weatherproof cased Temperature and Temperature/Humidity loggers, with internal or external sensors. External temperature sensors available include Digital, Thermocouple, Thermistor or PT100/PT1000. Wireless Weatherproof cased Universal input loggers, to connect a wide range of external sensors, including DC Voltage, 4-20mA, Pulse, Bridge, Resistive and relay input. Wireless Voltage Input Loggers with integral energisation outputs to power a variety of sensor types. Extremely Capable Loggers for monitoring transportation systems or goods during transportation, with Wireless Communication. Monitor shock events, temperature, humidity, light levels. Temperature and Deformation Loggers to monitor the concrete setting and curing process. Data can be retrieved or sent wirelessly to the host software package. A variety of accessories for the Wireless Logger range of products, including probes, sensors, antennas, cables, USB relay alarm etc.